Senior officials in Israel confirmed reports on Monday that a British court issued a warrant against opposition leader Mrs. Tzipi Livni for her role in orchestrating Israel's military offensive against Hamas in the Gaza Strip last December. British sources reported that though a British court had issued an arrest warrant for Livni over war crimes committed in Gaza, it annulled it upon discovering she was not in the U.K.
As many of us predicted for more than a while the tide is changing. 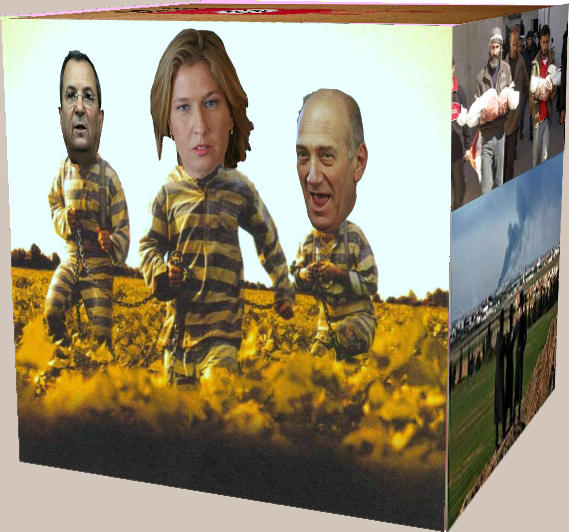 Now Israeli political and military leaders are finally being chased. Miliband maintained that “the British law permitting judges to issue arrest warrants against foreign dignitaries without any prior knowledge or advice by a prosecutor must be reviewed and reformed”. I find myself puzzled, why exactly this law is to be ‘reviewed’ or ‘reformed’. Is it because Britain decided to give up on its ethical tradition? Or is it because Miliband needs the support of the Labour Friends of Israel so he can be re-elected. Or is he just revealing an ever-present hidden cronyism? Miliband said that “the British government was determined that arrest threats against visitors of Livni's stature would not happen again.” And I find myself bewildered again, what does he mean by “Livni’s stature’? Does he really mean that ‘Livni like’ genocidal murderers are now welcome on British soil? "Israel is a strategic partner and a close friend of the United Kingdom. We are determined to protect and develop these ties," Miliband said. This obviously brings to mind the old saying ‘tell me who your friends are, and I'll tell you who you are’. Considering Labours recent history (aka Illegal wars and foreign invasions) it is far from surprising that Miliband has so many friends in the Jewish state. And not just ordinary Israelis but actually the leading mass murderers. According to Haaretz, Miliband called Livni to express his shock over the arrest warrant and pledged to address the matter immediately. Years ago, when we were young and naive our lecturers on politics insisted on telling us that judicial independence is crucial to the democratic process. Seemingly this principle is not highly regarded by Miliband who professes to spread democracy around the world. Miliband may benefit from spending some time with my son’s primary school teachers so he grasps what democracy stands for. Livni clarified that she “doesn't view the arrest warrant as a personal offense, but rather one that affects Israel as a whole.” She is obviously right. The Israeli society is regarded by the growing European masses as a criminal exterminatory state. The arrest warrants against Israeli leaders are indeed just a symbolic act. Prime Minister Benjamin Netanyahu on Tuesday issued a statement saying "We will not agree to a situation in which Ehud Olmert, Ehud Barak and Tzipi Livni will be summoned to the defendant's bench…We will not agree that IDF commanders and soldiers, who - heroically and in a moral fashion - defended our citizens against a brutal and criminal enemy, will be condemned as war criminals. We reject this absurdity outright." It is pretty obvious where Netanyahu is coming from, yet, the Israeli PM must fail to see that dropping white phosphorous on civilians is not exactly what Europeans and cultured people regard as ‘heroism’ or ‘moral fashion’. The Israeli Foreign Ministry is almost as amusing as its bigot Minister Avigdor Liberman. In an official statement the Ministry declared "We appreciate the British government's desire to play a central role in the Middle East peace process, and thus we expected it to translate the importance it gives its relations with Israel into actions.” Let’s face it, intimidating is a common Israeli tactic. Yet, the fact that Israelis want us to believe that they are heading towards peace is less than comical, it is downright treacherous. Britain is not going to play a part in the ‘peace process’ because there is no such process. In response to the warrant, Livni deflecting personal guilt said Tuesday that “she would not accept any accusation that compared Israel Defense Forces soldiers to terrorists.” She is actually correct. The so-called ‘terrorists’ are in fact freedom fighters. Israel on the other hand is a racist expansionist state. Its military forces are engaged in a continuous crime against humanity. Israel is as vicious as Nazi Germany but in practice, it is far worse for it is a ‘democracy’. Its murderous practices are a direct reflection of its peoples wishes expressed in a democratic vote. At the peak of the IDF's brutal Gaza campaign 94% of the Israelis supported the lethal measures against the Palestinian population. Israelis are not terrorists, they are actually the embodiment of terror.